How to organize files and folder of your computer to save searching time? "There are a lot of methods and techniques for managing or organizing computer files into appropriate folders and sub folders into folders with high efficiency, increased productivity and reducing searching time"
The following 8 tips will help you for organizing your computer files. For many reasons, it's smart to take advantage of the Documents feature, which is called Documents in Windows 7 and in Windows Vista and is called My Documents in Windows XP. 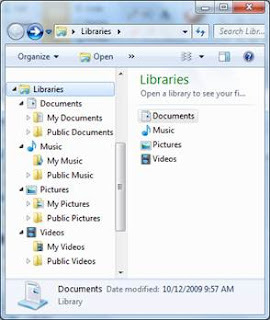 To open Documents in Windows 7 and Vista, click Start, and then click Documents to discover an easy way to store your personal documents. 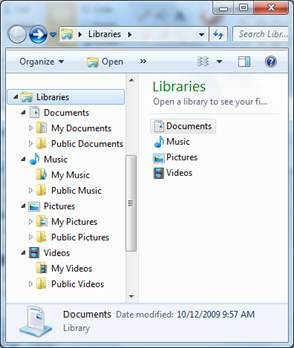 In Windows 7, the Documents feature is actually a virtual library. By default, the Documents library includes your My Documents or Documents folder and the Public Documents folder. You can customize the Documents library (in addition to the Music, Pictures, and Videos libraries that are also included by default) in Windows 7 to group files and folders from any location on your computer—without actually moving them. Or you can build your own libraries to easily organize your files. Learn more about working with libraries. 2 : Adopt consistent methods for file and folder naming : When learning how to manage files and folders, it is important that you develop a naming scheme for the kinds of files you create most often and then stick to it. To change an existing file or folder name, right-click the name in the folder structure. ClickRename, and then type the new name. 3: Keep names short : Even though you can use long file names in Windows, you should not necessarily do so. Long file names can be harder to read. 4: Separate ongoing and completed work : To keep the Documents folder from becoming too unwieldy, use it only for files you're actively working on. As a result, you can reduce the number of files you need to search through and the amount of data you need to back up. Every month or so, move the files you're no longer working on to a different folder or location, such as a folder on your desktop, a special archive folder, a flash drive, an external hard disk drive, or even a CD. 5: Use shortcuts and shortcut links instead of multiple copies : If you need to get to the same file from multiple locations, don't create copies of the file.Create shortcuts to it instead. Shortcuts are links to files or programs and are represented by icons with an arrow in the lower-left corner. To create a shortcut, right-click the file and then click Create Shortcut. You can drag the shortcut to other locations. 6: Quickly get to the items you use every day : Jump Lists, a fun new feature in Windows 7, are lists of recently opened items, such as files, folders, or websites that are organized by the program that you use to open them. You can use a Jump List to open items, and you can even pin favorites to a Jump List. Put Documents on the desktop. Color-code your folders: Use a third-party program which allows you to "color" certain folders in Documents. This helps you find your documents even more quickly and is especially useful with folders that you use every day.